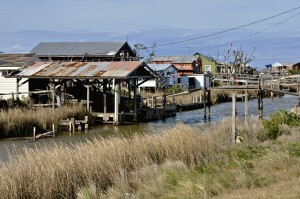 A Native American tribe located in coastal Louisiana will become the first community in U.S. history to be relocated due, in part, to rising sea levels, said Marion McFadden, a spokeswoman for the U.S. Department of Housing and Urban Development, on Thursday. The Isle de Jean Charles Band of Biloxi-Chitimacha-Choctaw has lost 98 percent of its land since 1955, according to a HUD report released in January. Tribal land loss has been attributed to rising seas and to sediment mismanagement caused by nearby oil and gas operations, according to a 2008 study by Northern Arizona University. Their canals ushered in saltwater that steadily eroded the freshwater wetlands. The relocation is projected to begin as early as 2019. In a statement, advocacy group Climate Nexus characterized the relocating tribal community as “refugees” of climate change. Louisiana state official Patrick Forbes told Reuters that federal officials didn’t consider the tribe to be refugees. “I think of refugees as being scattered and chaotic retreat. This is a resettlement and we are careful to use that word,” Forbes said. HUD has earmarked $48 million in federal grants for the tribe’s relocation, Forbes added. Tribal members told the New York Times in 2006 that residents have seen a football field of wetlands vanish every “every 20 minutes, every half-hour, every hour.” According to the NAU study, the island was once approximately 23 square miles in area. Today, it’s been reduced to an area about a quarter-mile wide and a half-mile long. The tribe first settled the Isle de Jean Charles in the early 1800s while fleeing forced relocation under the Indian Removal Act, according to The Guardian. Deputy chief Boyo Billiot told Reuters that the land loss, coupled with intense storms in the region, have caused the tribe’s numbers to shrink from a peak of 400 people to around 100. The tribe has been fighting for relocation funding for the past thirteen years, chief Albert Naquin told Indian Country Today in February.